Rising Sign (Ascendant) is the sign on the cusp of the first house of the natal chart. It is the sign (and degree of that sign) that is rising on the Eastern horizon at the moment of birth, with respect to the place of birth. The Ascendant is one of the four angles of the chart. The other three are the Descendant (directly opposite the Ascendant), the Imum Coeli (IC), and the Midheaven (MC). It is believed that if the Ascendant falls closer to the beginning of the Sign, the stronger the effects will be felt in the individual. This is also held to be true if the Sun is in a weak position in the birth chart (such as if the individual was born at night). Its also thought to be weaker when the individual is born towards the end of the Sign’s Ascendancy, just before the next Sign appears. Technically speaking, your Rising sign - or ascendant - reflects the zodiac sign that was ascending on the Eastern horizon at the moment you took your first breath in this world. This is why an exact birth time is so vital to finding your accurate rising sign. 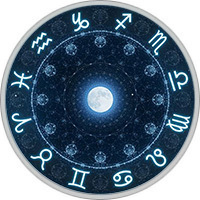 Located on the cusp of the first house of your astrological chart - or at the nine o’clock position - the rising sign can exert an influence almost as powerful as your Sun and Moon signs. If you were to think of your Sun sign as your soul - your inner personality and potential - and your Moon sign as your heart - your emotional core - then you could say that your Rising sign is your physical self or the face you present to the world. For example, though your Sun sign might be Taurus, your Rising sign could very well be Gemini. While you’re feeling laidback, others will tend to see you as a ball of nervous energy and cerebral wit. At times, your Rising sign may act as a mask, hiding some aspect of your inner self you don’t feel like revealing. What’s your mask? How do others see you? Find out by exploring the qualities of your Rising sign. The Ascendant defines, in part, the first impression we make on others in a personal rather than professional sense. It represents our physical appearance, our physical bodies and overall health, and the body ego. The Ascendant is often referred to as the mask we wear, although I don’t consider it to be as superficial as this might suggest. What it does represent is our natural and personal defense mechanisms that we use to adapt to, and cope with, our environment. The Ascendant also shows our first impressions of the world around us, and reveals our expectations of the world around uswhether we are naturally hesitant or enthusiastic, for example. How we begin new projects, and our attitude towards new experiences come under the rule of the Ascendant.